In 2013, a group of librarians in northern Illinois teamed up to create “Soon To Be Famous: The Illinois Author Project” to demonstrate how important self-published books can be in the lives of readers. 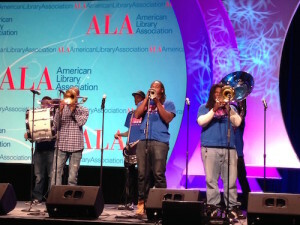 They were inspired by a talk given by academic and author David Vinjamuri at the 2013 ALA Annual Conference in Chicago, where he noted that libraries were paying $84 for books that patrons could buy for $14. He challenged his audience to do something about that. Denise Raleigh, of the Gail Borden Public Library District in Elgin, Illinois, decided to accept the Vinjamuri challenge and, with some colleagues, came up with a “library staff­-curated project” that would highlight the best new self-published novels in Illinois. 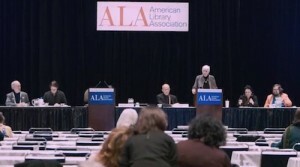 “All the judges were librarians,” she told the Masters Series audience on Monday, “and all the promotional videos were produced by library staff.” One of their YouTube videos, It’s a Writingful Life, a parody of the 1946 movie It’s a Wonderful Life, examined what would happen if an author decided never to have written any books. Submissions were restricted to self-published adult fiction by Illinois authors who asked their local libraries to nominate them for the contest. Entries for the first competition were due by December 30, 2013, said Donna Fletcher, a library consultant in Highland Park, Illinois, but only 40 entries had come in. Luckily, a January 1, 2014, article in the Chicago Tribune highlighted the contest and pushed the number of submissions up to 103 by the extended deadline of January 6. The winner was The Things We Save, a novel by Joanne Zienty, a resident of Wheaton, Illinois, and library media specialist at the Forest School Library in Des Plaines. The award ceremony was held on April 16, 2014, at the RAILS (Reaching Across Illinois Library System) headquarters in Burr Ridge, Illinois. The four ALA presidential candidates respond to audience questions at the Midwinter Meeting.